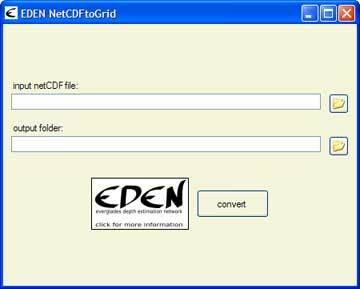 EDEN NetCDFtoGrid is a program for converting EDEN water level, water depth, and days since dry files from netCDF (.nc) format to ESRI Grid format. Note: This tool only works on 32-bit machines. For users with 64-bit machines, please use the Multidimension Tools toolbox found within ArcMap to convert NetCDF files. Runs only on 32-bit systems. For users with 64-bit machines, please use the Multidimension Tools toolbox found within ArcMap to convert NetCDF files. Click on the second folder icon to browse to the folder where you would like to save the output file. Type in an output name. Available for download at http://sofia.usgs.gov/eden/models/watersurfacemod.php. We're looking for feedback! Please contact us.